In the 53 years since I began teaching in the Rochester, New York area I’ve seen a number of developing plays, books, TV studies, and whatnot about two local historic pioneers in American civil rights, Susan B. Anthony and Frederick Douglass; this is the best dramatic treatment thus far to deal with their achievements and close relationship. 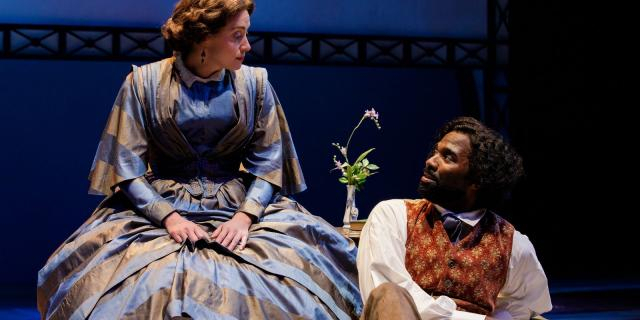 Late in the play, Douglas confesses regret to Anthony because he had earlier agreed to support a Constitutional amendment that would permit black men to vote but not women. He admits that he was convinced that once all races of men could vote, it would be no more than two decades before women would get the vote. Forty years later that still had not happened. So there is much to learn and be reminded about in this charming play, which does have its dramatically moving moments and amusing action and dialogue. Beautiful lit frames inform us of dates and locales and occurrences, A central bare stage seamlessly adds furniture and objects and costumes in Jack Magaw’s handsome stage designs and Jessica Ford’s presumably historically accurate (and sometimes surprising) clothing. Time, space, and especially mood change potently in Christine Binder’s complex lighting. We get to learn about, like, and presumably understand, these two extraordinary people. And certainly there are a downright uncomfortable lot of contemporary parallels evoked in the evils of our society that these reformers condemn. Madeline Lambert’s Susan grows in humanity as she ages in appearance and movement. Hers is a memorably subtle and convincing performance. Cedric Mays not only ages convincingly in the play but constantly increases Douglass’s magnetism as his wisdom and disillusionment increase. And Logan Vaughn’s direction provides what variety she can in skilled, fluid blocking. But this clever, presumably historically accurate, and entirely likable presentation is still a good deal more informative and significant than it is compelling or dramatically engrossing. I would not take a young child to sit through its two hours and fifteen minutes. Technical: Set: Jack Magaw. Costumes: Jessica Ford. Lighting: Christine Binder. Sound: David Lamont Wilson. Music: Juliette Jones. Wigs: Dave Bova. Dramaturg: Jenni Werner. Stage Mgr: Frank Cavallo.